Teenagers often act as though they have no regard for anyone or anything but themselves and things that belong to them. Manners they might have had when they were younger seem to have gone out the window and back-talk is an everyday occurrence. It can be “heart breaking” especially when we reflect back at their innocence during the early years. When we say we love our children very much, automatically our hand touches the heart-the chest area. This is the place which stores all our feelings of compassion and love towards others – which can be further explained as the harmony of relationship with others. Click Here to Read & See More.. Here is a set of excellent great old gems of Smt.N.C.Vasanthakokilam. 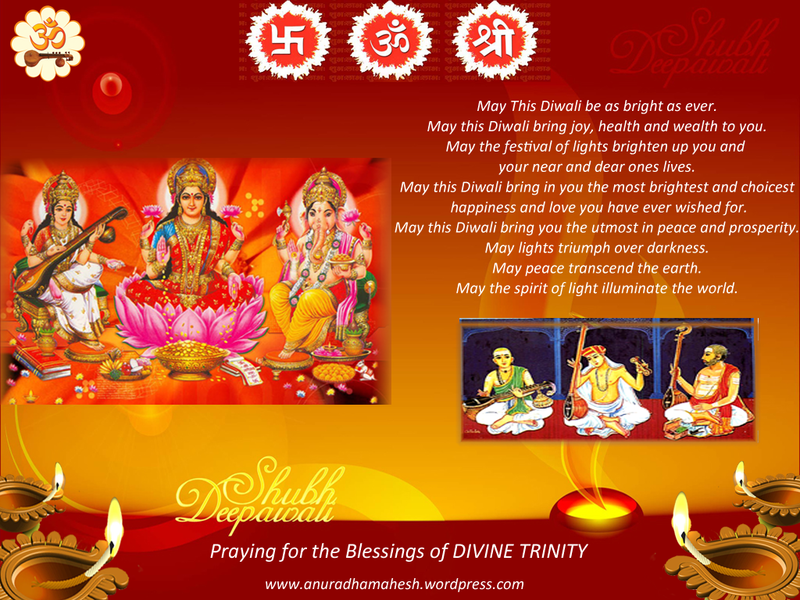 This is a contribution from Sri Sankar CS who is a regular visitor of this blog. Thankyou very much Sri. Sankar for sharing with all of us the great music of NCV. There’s always something warm and bright, about this time of the year, when everything has a special glow, and hearts are full of cheer, that’s why, this special greeting comes your way, to wish you all life’s best on Diwali and in the coming year too. I came to know that many other carnatic music blogs have copied major contents from my blog’s pages mainly from pages Music Therapy and Carnatic Raga Appreciation though many of them have given credits to my name. From this I understand that they have gained much more knowledge in Carnatic Music and am happy that they are spreading the knowledge through their blogs. But I would have been more happy if they had put only comments or review on their blogs with a link to my blog rather than simply copying the content. Creating the content, as you may be aware takes many days of research,effort and hardwork (and sleepless nights too). Simply copying it hurts my feelings. Please refrain from copying more contents from my blog. I am doing this work related to music purely with the intention of bringing the younger generation closer to Indian Carnatic Music and also to all those who are interested in music to the sheer pleasure of listening good music. I do not post any copyrighted content here. Only live concerts and raga based songs I have in my collection are posted. And the only return I get from this blog is the genuine comments/suggestions / from my readers which makes me very happy as most of these comments sends prayers to me and my family which I believe is more than anything in this world to me. Last, but not the least, as a reader commented, there may be spelling mistakes which I would call as “typo” rather than mistakes. Please bear with these simple mistakes and do visit the blog and enjoy music. Dear Readers..It is only because of you, this blog has gained so much of popularity.